A converted Ben Blair drive over try from a Cayman lineout secured by Cayman lock Yohann Regnard gave Cayman some much needed breathing room to take the game to 10-0 and Cayman’s opening try started a flow of points for the local boys which featured a Vanassio Tokotokovanua try and 2 Robbie Cribb tries to earn Cayman not only a win but a much needed bonus point. Bahamas earned a consolation try with the final play of the game when powerful no. 8 Devon Woodside crossed the line to ring in the final whistle in front of a jubilant home crowd. 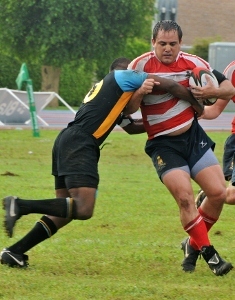 The bonus point win over the Bahamas and the bonus point loss against Bermuda puts Cayman in a strong position going into the 9 June clash between Bahamas and Bermuda and whilst the defensively weak 2nd half performance by the Bahamas will raise doubts that the Bahamas will be successful at home against the current Caribbean champs Cayman will be cheering on Bahamas in their next venture. Should Bahamas lose to Bermuda the Cayman National XV’s Caribbean Champs and World Cup Qualification process will be over. The win over the Bahamas sees Cayman leapfrog Barbados and Singapore in the IRB world rankings to 66 and secures Cayman’s position as the 4th highest ranked Caribbean Nation behind Trinidad and Tobago, Bermuda and Guyana. Should Bahamas beat Bermuda and the Cayman Men’s XV progress to their 2nd Caribbean Championship Final they will likely meet either Guyana or Trinidad and Tobago away on 23 June.